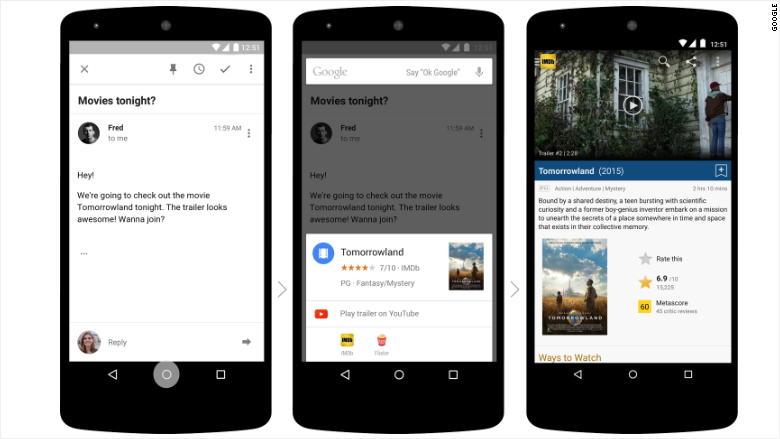 Google Now on Tap makes your smartphone smarter. How smart is your smartphone, really? It does a whole lot of tasks -- but you still have to work harder than you should to get stuff done. Think about it: When your friend texts you to meet at 8 at a particular restaurant, it will probably take you three minutes to set up a calendar event for yourself. You have to close out of your messaging app, open your calendar app, set the name of the event and the time. Then you have to go to the Google app, search for the restaurant, find the address, open the calendar app again and paste it into the event's location field. That's why Google (GOOGL) invented Now on Tap, one of the coolest products the search company has ever released. Now on Tap promises to take that texting scenario from three minutes down to three seconds. Here's how it would work: Once you receive the text, hold down your home button and say, "OK Google, set a calendar appointment for this." ...and that's it. Now on Tap, which is exclusively available in the latest version of the Android, does two really innovative things. First, from any website or app on your Android smartphone, you can hold down the home button to get instant information about what's currently on your screen. Second, you can bark commands at Now on Tap or ask questions related to what you're looking at. So when you're reading a story in the Bleacher Report app about Tom Brady, you can say, "OK Google, how many touchdowns has he thrown?" and your phone will read you the answer out loud (408). It knows who "he" is, because the story is about Tom Brady. Or when your wife tells you to she wants to see the movie, "Bridge of Spies," you can hold down the home button and instantly get reviews and news about the film. None of that was possible before without exiting an app you were in and opening a browser page or another app. Now on Tap lets you stay within the app you're currently using. That's hugely helpful, because 80% of the time people spend on their phones is in apps, according to Google. That's a very different experience from laptops, where a Google search is just a right click or a new tab away. "Assistance is the new black," said Aparna Chennapragada, project manager for Google Now. "We're trying to figure out how we can understand your context, how we can get you quick, actionable information and how we can help you get stuff done." The promise is great. But right now, it's very early days for Now on Tap. Today, it essentially just copies and pastes relevant text from your screen into a Google search to get relevant information. It launched with a focus on restaurants, music, movies and people. You can get locations for places to eat, links to play songs, reviews for films or information about celebrities. Google Now on Tap also recommends apps that might have more information about what you're looking for. Down the road, Now on Tap could do so much more. Imagine reading an interesting story and saying, "OK Google, send this to my wife." Or maybe you're in a recipe app, and you hold down the home button to add the recipe to your shopping list. That kind of stuff is coming. Chennapragada said Google Now on Tap will follow the same playbook of Android's proactive "Google Now" assistant: start with a small handful of interactions at launch and then "iterate the heck out of it." (Google Now wasn't much to look at a couple years ago, but now it's one of Android's best features). There are technical hurdles to clear before it gets there. For instance, the Now on Tap team still needs to figure out your intent: When you hold down the home button, do you want to know the next news story about Donald Trump, or do you want to know what his Twitter handle is? Though that's not trivial, it's something that Chennapragada believes will soon be overcome. "The smartphone just needs to get smarter," Chennapragada said. "I'm doing a lot more heavy lifting than the goddamned thing and it needs to be the other way around. It is with me all the time and should know what I care about. -- and it should help me benefit from other people that have done this task before."